Ramanuj Mukherjee, an alumnus of National University of Juridical Sciences, Kolkata, is a lawyer turned entrepreneur. He used to work at Trilegal (Mumbai) before starting iPleaders, a legal education company seeking to make law easily accessible to everyone. He has also launched a non-profit social network Clathacker which provides study material for CLAT and a legal career insights website Super Lawyer Ramanuj also conducts workshops at numerous colleges across India, including IITs, NITs and NLUs on subjects like public speaking, interview skills, entrepreneurship and business laws. Live Law: After completing your Law from NUJS, what motivated you to give a chance to your entrepreneurial skills? Ramanuj : I did not wait to graduate to try out my entrepreneurial skills. My experiments started in the college itself. I managed a team of 20 freelancers to develop the content for a major CLAT coaching for 3 years. I also got the opportunity to travel extensively to take CLAT related classes, even learn some marketing in the process. I also visited various schools and talked to students about law as a career. During college, I was also ghost writing textbooks for some well known authors. These exposures taught me a few fundamental skills like conceptualizing a course, resource planning, managing a team, making provision for contingencies, marketing, persuasive public speaking and even sales to an extent. I started building CLAThacker in my 3rd year in law school to show someone at IMS the potential of a good online forum in the testprep market – and why the online component of courses are very important. Over time, CLAThacker has grown rapidly. In the same year, I also started attending an event called Startup Saturday, where I met startup software entrepreneurs. I was fascinated by the way they worked. I started helping some of them with their legal needs, but it was the business side of things that really attracted me. I realised that while lawyers made contracts and got involved when there was a dispute, legal risks arose much early in every business. I, alongwith a couple of my friends, started a firm for legal risk management consultancy – where we helped businesses identify legal risks before they materialized and a dispute came into existence. While we could not practice law, we could work as management consultants as long as clients were willing to hire us. This firm was a big hit, and we worked with everyone form start-ups to some big conglomerates. Business tycoons were amused that young law students were offering management consultancy, but they saw the value in our work and the reality was that no one else was doing that work. We would secure meetings with top businessmen in Kolkata and sometimes other cities and ask them to give us a shot. We’d tell them, “you have a lawyer but you don’t have anyone managing legal risks for you. We will identify the risks and help you to eliminate them.” People hate to go to court, so the pitch worked well, and some of them obliged. At the same time, as we interacted more and more with software startups – we became comfortable with the idea of creating products rather than providing services which does not scale beyond a point. We also wanted to have maximum impact based on our skills, and teaching law to entrepreneurs seemed to be the logical answer. Hence, we decided to build online educational products for the same. By our fifth year, we had successfully launched BarHacker.in - a test prep for the All India Bar Exam in a JV with LegallyIndia. This fous on online products led us to talks with NUJS administration to see if we can help them build online courses. The foundation of iPleaders was thus already laid before we left NUJS. After working in a law firm for a year, I became sure what I wanted to do and that was building online legal courses. Nothing else seemed even remotely as interesting as starting up. Everything else was learned on the job - directions became clear as we struggled through various challenges. Live Law:Why didn’t you go for litigation? Ramanuj : At some level litigation always fascinated me. However, at that time, I was sure that I want to begin my career in a law firm. I chose my internships accordingly. It was only after working in a law firm for a year before leaving and later seeing most of my batchmates quit their firms citing various reasons, I have come to the conclusion that at this point of time, litigation is the conventional best for the most cerebral and bright lawyers. Litigation also has an element of entrepreneurship – one must understand the business apart from learning the skills. My choice to start at a law firm was also a product of my financial situation. In college, I had an educational loan to pay back. I was always under the opinion that there is very little money in the initial years in litigation. While working at Trilegal, I was abale to pay down my loan aggressively in a matter of few months. That, I felt, would have been very difficult in litigation. However, I later realised that the earning situation in first few years of litigation is not as bad as people make it out to be. Quite a few of my friends have made decent money, even in their first or second year of litigation since provided they planned things well. I will definitely consider human rights litigation at a later point of my career. Right now I am just too busy with the startup and there are a lot of other things to do as well. I hope that someday I will have adequate time and resources to start taking pro bono cases for people who cannot hire lawyers. Live Law: Why didn’t you go for LLM? Ramanuj : LLM is an academic master’s degree. I didn’t need a master’s degree in my line of work. Today, I find that many people treat LLM as an automatic course of action after LL.B.–this did not make sense for me. Practicing law does not require a master degree, and it has never been a priority for me – though my parents insist that I should get a master degree as a matter of pride for them. I may prefer an MBA. In any case, I don’t see myself going for any further education before I can take a year or two off my current ventures. I would also have to see a point in it in terms of significant capacity building. Live Law: what are your comments on Law Universities. Whether the law schools are losing their charm? Ramanuj : Law schools were instant hit because the alternative legal education available was just too terrible. In that market, even reasonable quality seemed like something invaluable. Expectations of students from law schools, however, have certainly increased. It does not look like law schools are ready to meet those expectations because they are mostly failing to evolve, with just a handful of exceptions. Also, there is a clear trend in law schools of being completely dependent on the Vice Chancellor for progress. If there is a good, imaginative, hardworking VC at the helm, the University do well - if not, everything falls flat. This is a very dangerous trend. Live Law: What is the basic difference between your college life and your professional life? Ramanuj : College life was care free - I worked on everything I wanted to work on and I travelled for fun every month. Now even though I travel every month, rather every week, but it is for work. There is a responsibility upon me to run an organisation, pay my employees and what not. College was a great time to do experiments and innovate; I feel that it is more difficult to take big risks now. Live Law:What are you upto now, what is the objective of your life? 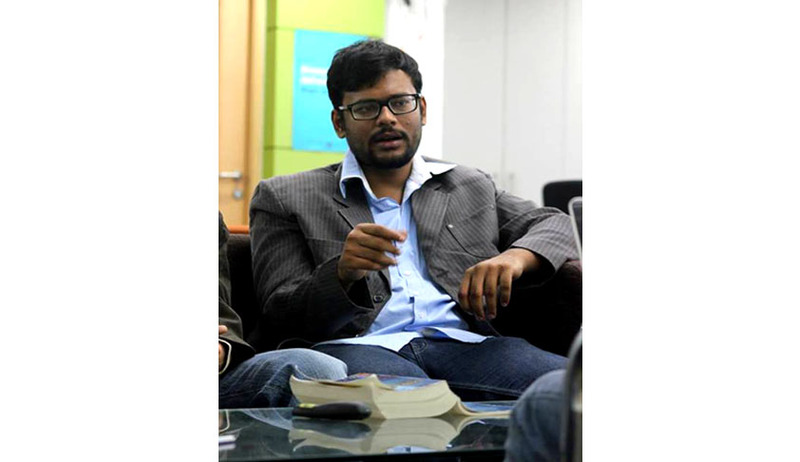 Ramanuj : Most of my goals are around making law more accessible. I also want to write non-fiction books - this has been a dream for some time. I also want to build an organisation where I am completely dispensible – it should not make any difference if I am not around. Live Law: What do you expect out of yourself in next 5 years? Ramanuj : Build iPleaders into a global education powerhouse. We are seeing tremendous growth in B2B side and I will like to keep this momentum on. Also, we want to grow on our own terms, without compromising on our principles and without having to accept external investment. Live Law: Not every law student can risk himself/herself for an entrepreneurial venture, what according to you one should have in mind while starting something new? Ramanuj : Work in an industry you know well. Work on a problem you faced and solve it with a product. If you are charging X for a product, try to deliver 10X value. Don’t make copy of another successful product, try and make something truly unique and remarkable. Find great people to work with. Simplify things to the point that any task becomes easy to do and manageable. Ask around for help. Learn detachment. Learn to be fully committed despite being emotionally detached. Live Law: Of late you have been very active on social networking sites commenting or promoting some national parties, doesn’t it ever bother you or come in the way of your career? Your views on politics + Law? I am not a politician, nor do I plan to become one. I am not a member of any political party. Ideologically, I support AAP because I believe that it is a movement of the educated class in India to claim back the political space from criminals and tricksters. I deeply feel about the misery of people, palpable injustice in every strata of the society and deep seated corruption in our country, and I believe that political solutions to these problems are essential. It is possible that some people may be antagonized because of this, but my principles and beliefs are very important to me. On a general level, however, I found that most people who matter can set aside political differences and work together for a common goal on a professional front. Lawyers make great politicians. I wish more young lawyers will take up important role in Indian politics. Live Law:We are seeing much debate on the series of topic concerning National Law Universities and other law colleges? Be it internship or jobs, talent or skill, the priority is given to the Students of National Law Universities. Your views on this debate? Ramanuj : I have hired from top tier law schools as well as non-NLU law grads. I found that the students from top NLUs are often much more skilled when it comes to freshers. Of course, there are all kinds of exceptions. However, after working for a year or two, that difference does not remain very noticeable. Being from a non-NLU law college may be a bit of disadvantage, but not a handicap you cannot overcome. Some students bridge the gap in college itself and some do it later on as they progress in their career. Shobhit batta is Student Reporter at Live Law.